This bold yet elegant masquerade-themed Quinceanera invitation offers a choice of three background colors: black, fuchsia, and green. 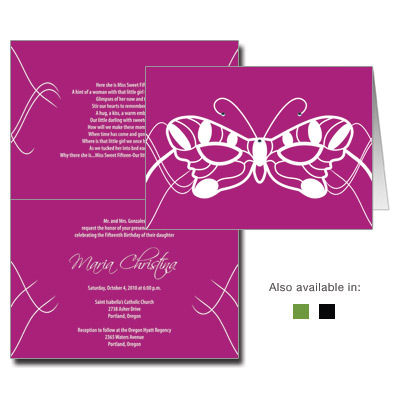 A butterfly mask is featured on the front of the card above delicate script and accented with three bright jewels. Folded card comes with silver stick-on jewels and measures 7x5.